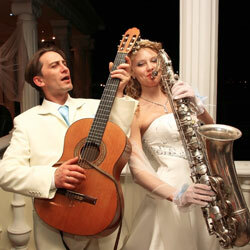 Everyone wants their wedding to be memorable, entertaining, fun and unique! And entertainment should surprise, amuse, intrigue and engage. It should not be standard or ‘Oh yeah, I did that last week at...’ Let your story, your day be original in every way and make your guests feel special and involved in this experience too - from the youngest to the oldest. There is an ever-growing market of entertainment providers - from casino parties to dueling pianos, Hawaiian luaus to dance instructors. Some of the most rewarding and fun entertainment is cheap - but it does require planning and creativity.By careful consideration of your guests and your own personalities, you can produce a tailor-made mini-festival to keep all your loved ones smiling and entertained while you are either being photographed or catching up. Inviting children to your wedding always raises the fear that they will run amok or start wailing at critical times, bored and overwhelmed by events. By having a designated children’s entertainment corner, you can alleviate this stress and keep both your guests-with-families and those without happy. Consideration of your wedding guests and how they can get involved with the themes and emotions of your precious wedding day is demonstrated through the novel wedding ideas for entertainment you offer. Throw a reception party that states this is our celebration and you are most welcome! Cool Cat Sites Entertainment Inc. Cartoon Portraits by Deb & Allentoons Ent.